With minimal planning, my husband and I, with a 12-year-old, 8-year-old and 2-year-old in tow, took the family’s first trip to Disney World armed with technology: an iPad, an iPhone, a laptop, a Droid and lots of apps. First up, we used the new DFW Airport app to track flight information and our go-to family calendar app, Cozi, to check off our packing lists. At our hotel, we configured the apps on our tablet and laptop, because sometimes it’s easier to set up and familiarize yourself with a new app on a bigger screen. In between conference seminars at Disney World, I took the 2-year-old to Magic Kingdom to explore the new Fantasyland while my husband took the older kids to Epcot. With two apps, one by Disney and the other by Undercover Tourist, my toddler and I took off with a two-hour time frame. I used the GPS-enabled maps on both apps to check wait times and held my breath. We were able to go on three rides, get a snack and see a show. Here’s a quick guide to the apps I used. 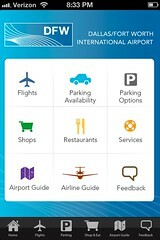 What it does: The mobile app allows travelers to check flight information up to 12 hours in advance, view parking availability and see what shops, restaurants and services are available near a gate. Pros: The app is simple to use and the “Within 5 Minutes of My Gate” feature is a quick way to find restaurants, charging stations, mailing services, luggage carts, etc. Cons: It’s missing an important category: restrooms. It would also be great to find out if there are any family restrooms or baby-changing stations. A workaround is to go to the “others” category and tap on “Travelers Aid,” which is intended to show the guest services desk, but the map also shows locations of restrooms. Also, I was unable to find the “Children’s Play Areas” category. By scrolling down, I found them in the “Within 5 Minutes” category. Good to know: If you’re using valet, you can make a reservation on the app before you arrive. What it does: This is a go-to family app and website for centralizing and sharing calendars, to-do lists and shopping lists. Users can access the information on different devices and get sent reminders via text or email. Pros: For travel, it can be used for packing lists, dispersing flight information and sharing planned activities. You can also sync the app with your Microsoft Outlook calendar, import an Internet calendar and export a read-only view of family calendars. Cons: The upgrade to the “gold” version is a bit pricey (a recent special was $29.99 per year), but it may be worth it if you’d like the meal-planning function or hate seeing advertisements. 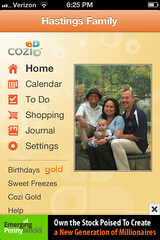 Good to know: You an access the app from any mobile browser at m.cozi.com. What it does: Disney’s official app provides maps of the parks, real-time wait times for rides and FastPass return times. If you’re staying at a Disney resort, you can access your hotel reservation and view and share your itineraries. Pros: There’s an abundance of map data that allows you to zoom in on attractions and services. The latest update has made navigation faster, addressing a common complaint in past user reviews. The best feature is “Here & Now,” a GPS-enabled map that displays the attractions, restaurants and services nearest you. This takes the guess work out of deciding which ride you should go on. For example, we were able to quickly determine whether we should go on Stitch’s Great Escape, a 20-minute wait, or go the FastPass route with an available time that was 10 minutes away. We went with Buzz Lightyear and were on the ride in about 8 minutes. We tested the app’s timing again in Fantasyland, where the regular line for Peter Pan’s Flight showed a wait time of 20 minutes. The app showed 10 minutes; we waited 11. For advance planning, hit the explore button to peruse the parks and filter for height requirements, “slow rides” and even attractions for tweens. Cons: Accessing resort reservations and itineraries was still a bit slow, and you need to constantly input your password. Good to know: You can also view menus and book dining reservations straight from the app. 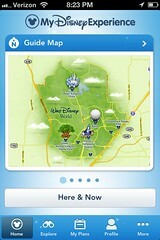 What it does: This is a popular alternative to the Disney app with similar functions — park hours, dining menus and maps. The app also allows users to rate rides and log wait times. Pros: The “Traffic Light System” for determining wait times (red signifies the longest, green the shortest) works well on the GPS-enabled map, which quickly shows the red, yellow and green bubbles around you. The “admit one” feature let’s you take a picture of your ticket. If you lose it, show the numbers at the bottom right of your ticket at guest services and they can access the information to get you back into the parks. Cons: The planner section was not intuitive and I couldn’t easily plan out an itinerary. You won’t be able to make dining reservations on the app. Good to know: A Universal Orlando version is also available. What it does: If you’re into scrapbooks, you’ll love this app, which allows you to decorate new photos or ones already in your smartphone library with Disney themes, characters and filters. Pros: Missed a character visit while you were at Disney World? 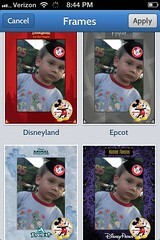 With this official app, you can still “pose” with Mickey by dropping in an existing image. You can also get crazy with stickers and borders. Share your decorated photos via text, email, Facebook or Twitter. Cons: The “Disney Time Photo of the Day” is OK, but what would be really cool is if the app allowed access to the PhotoPass pictures you purchased. Good to know: Are you a real Disney fanatic? The alarm clock feature allows you to set audio and video greetings from Mickey Mouse, Donald Duck, Goofy and Minnie Mouse. What it does: Disney Interactive has come up with an intuitive way to share life’s moments in a storybook format. Pros: The easy-to-use app will automatically arrange photos and videos on your iPhone camera roll based on the time and location. You can either build and edit your story from there or create a new story. The stories can be personalized with captions, pages of text, and themes and layouts. You can share your story via email or Facebook, and embed a story in a blog or website. The FAQs are extremely helpful. Cons: There are a limited number of themes available, including just one Disney theme. If needed, use the Disney Memories app to spice up your photos, then add them to your stories. The app, which was launched in May, is only available on iOS devices and you can only use photos and videos on your iPhone camera roll. However, if you upload photos and videos to your camera roll, you will be able to use those in your stories. Good to know: Every story you share is saved in the app and backed up in iCloud. Future updates may allow you to post directly to Twitter or Pinterest. For now, post a thumbnail and access a link to your story that refers back to Story.us.